Note: I skipped day four in Rapid City to go back later and hook it to some other cultural activities. Today let us tell you about the Badlands and the amazing wild(ish) animals we saw there. You may have to expand some pictures to see what we were seeing; I only had my phone for taking them. Oh, the animals! 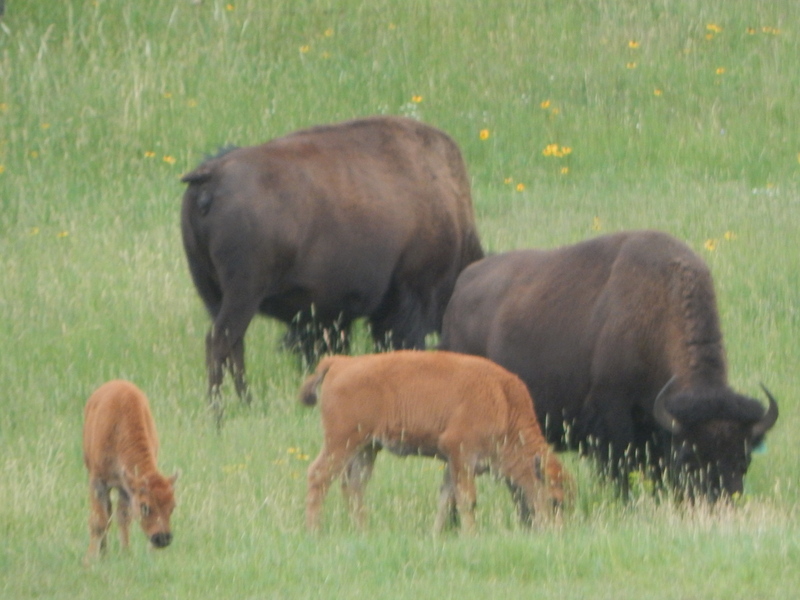 Oliver and Barbara were mad keen to see a buffalo, and I am a prairie dog geek, so we took them around the Sage Rim Road (unpaved) of the Badlands, and saw four sets of buffalo. Jack sat in the back and clung to the armrest with white knuckles. My beloved does not care for “unimproved” roads, but he knew how badly the rest of us wanted to see Robert’s Prairie Dog town and the Buffalo Wallow. We were not disappointed. The first buffalo was far distant, available only with the binoculars, and walking away from us. Still, B&O were happy: they had now seen one. We drove around a corner (note to self: do not let Oliver drive the wildlife loops because he turns into the guy who wants to Get There, even when there is no There to Get to) and nearly careened into a male and two females wandering aimlessly across the grasses. Buffalo are majestic but when they’re walking, it’s like watching an animal cracker move. They’re such odd shapes as they amble, like a pushme-pullme of Dr. Doolitte fame. It takes a bit of practice to tell which end is front. Replete with buffalo, we started up again and hadn’t gone a mile before I saw something in the grasses moving the opposite direction. It took a second to realize, but when I yelled “OMIGOSH a COYOTE!” Oliver threw us onto the roadside and was out of the car before the rest of us could get our seatbelts off. The coyote, a very large male, walked along the side of the road less than a quarter mile from us for a few miles, so we started driving along, getting a bit ahead and watching him coming. So long as we didn’t get into the grass, he didn’t care. 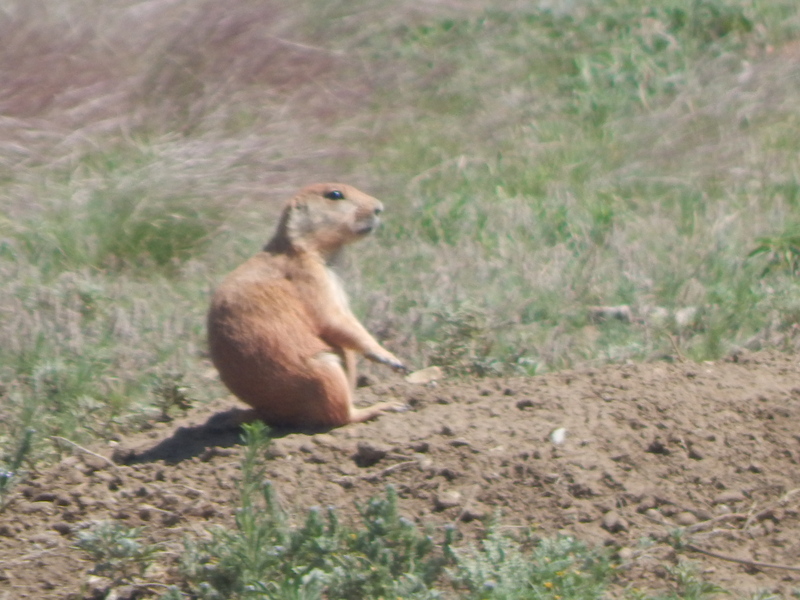 He was in fact much more interested in the prairie dogs who were very interested in what he decided to do next. He must not have been hungry, because he didn’t do much more than stare at one in a “do I want salad or protein” sort of way. He finally ambled off into the morning rain (which is why we were seeing so many animals; the drizzle had cooled everything nicely in a pleasant blue half-daylight. We figured it didn’t get any better than this until we climbed a peak and saw an enormous deer below. Mule deer it turned out, but I shouted Moose so Oliver would stop. I wasn’t sure “deer” would cut it. And in reaching the top of the peak to watch the deer watch us, we discovered why the Badlands have so little water. The hard rock hills we’d climbed the day before were now so soft, we gained five pounds in shoe clay and had a nasty moment when we all thought we were sinking. Now I know why they warn through hikers in the Badlands that you’d better know what you’re doing, not just about the water, but about climbing the rocks. They’re not really rocks, but porous clay cliffs waiting for unsuspecting people to sink into them. But we made it out, cameras full to the brim, went around the corner, and found a herd of long horn sheep resting, including one baby who wanted quite badly to cross the road and meet us. We had to shoo him back as the adults lay there, placidly chewing in the drizzle. It’s hard to get good child care these days, but he finally understood he should stay there. A coyote in the wild, four herd of buffalo, a second mule deer when we reached Sylvan Lake, and all the prairie dogs in the world–it was a good two days. 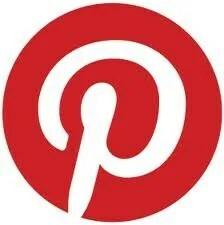 I’m just going to string the pictures below here because the Internet is hard to use in the Lodge and it may go out again any moment. We got pretty good at spotting the little mounds and holes of earth among grasses that signals one of these encampments, and congratulated ourselves on being good hunters. 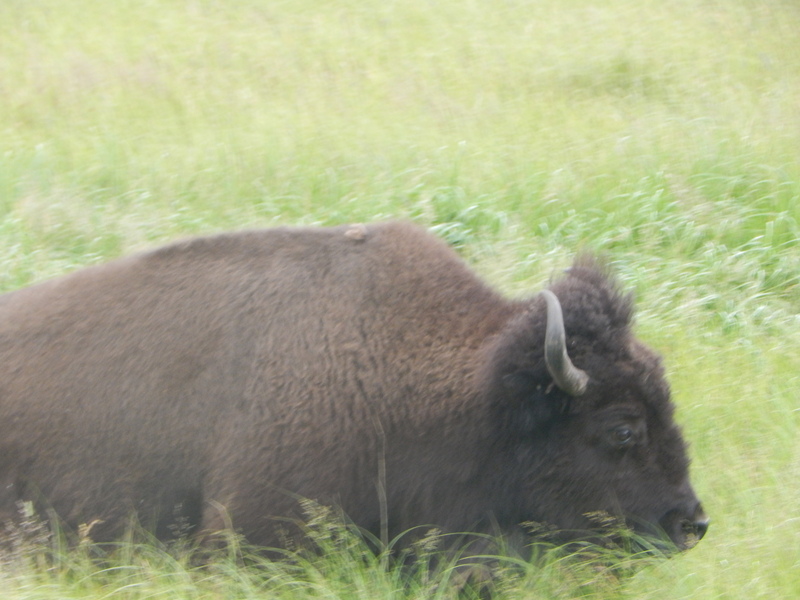 And then we passed the buffalo…. 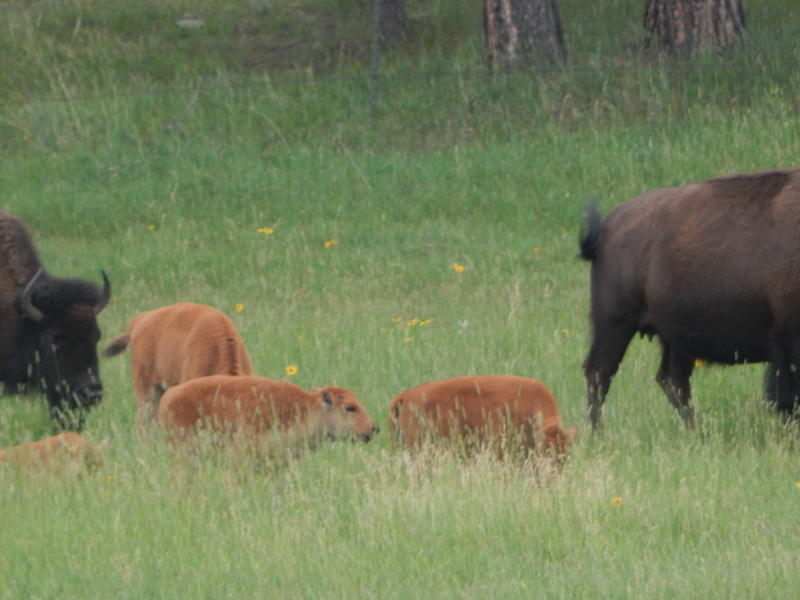 Three Wildlife loops and two hikes into our stay in Custer State Park, we’d seen neither hide nor horn of the great bison. 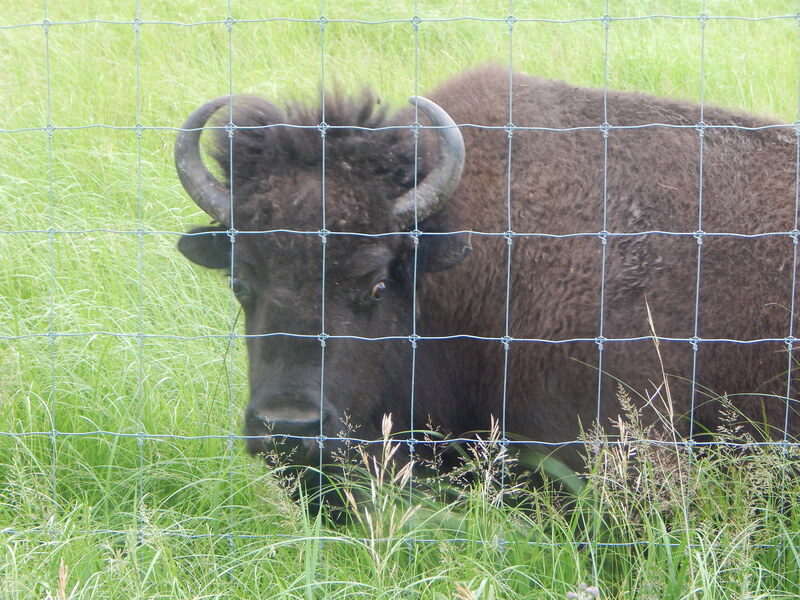 Since Jack had never seen a buffalo in his entire life, I was beginning to feel a failure as a tour guide. One night just about dusk we set out to do the Wildlife Road inside the park, confident that our ability to stay up past 9 pm would be rewarded. And we saw white tailed deer, and we saw mule deer, and we saw long horned sheep, and we saw antelope, and we saw what we think was a black foot ferret. You know you’re jaded when you pass a herd of antelope, glance over and go, “Eh, just antelope” and accelerate. We were hunting buffalo, after all. “A bear? !” I shrieked, driving faster. Our windows were down. So I’m sure there is a life lesson in here somewhere, kids. Don’t look too hard for something or you’ll miss the fact that it’s standing eight feet off your right shoulder as you scan the horizon. 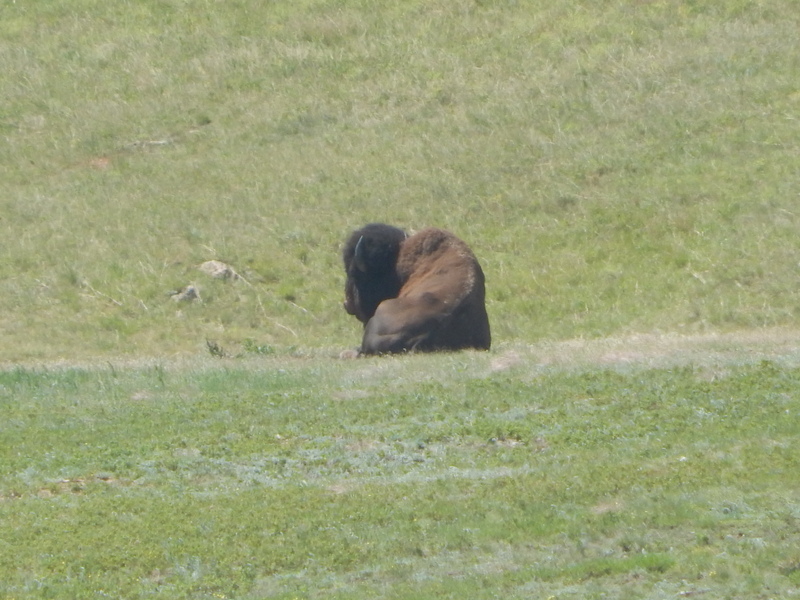 On a positive note, Jack said he could count its curls, and now he’d seen a buffalo that close, he never wanted to see another in such proximity again. This guy was enjoying the sun a ways off the highway as we traveled route 2. And this guy was at the entrance to the park when we came back. They aren’t actually penned in. A stretch of road that must be near their rounds has a cattle crossing grid at each end of it, and this hog wire fencing on one side. I think the rangers must have gotten tired of cleaning up buffalo and tourist parts from close encounters.